Two emergency gigs! I will be playing tonight at Stone's Throw in Bowling Green at 9:30. Tomorrow, I play at Howard's Club H in BG at 10:30. I will be accompanied by Nick Zoidberg for both sessions. Come see me! Still think racism is all in the past? Then read "School is Racist." What makes this that much more sickening is that this is all from kids. C'mon, people. We should be better than this. The New York Times nails it in the editorial "Political Lies About Police Brutality." Maybe some good will come out of all the horror. Hope so. Ages ago, I had a colleague read over something I'd written for an annual review, and he fixated on my use of the word "amongst." "Among," he pointed out, was the more acceptable and contemporary word, while "amongst" was merely archaic. This was true, I admitted, but since I get so little opportunity to express myself in formal documents, I'd rather just use the strange word as a release from the institutionality of the required document. Said colleague just shook his head and called me weird. I am weird. I have no problem with that. The language bit, though? I'm very much into letting my personality come through my writing, and I have no problem tweaking the expected language requirements to let that happen. There's nothing wrong with giving one's personality through, and using archaic and just plain weird words whenever possible allows this to happen...while still maintaining the required standards of formality. After all, amongst is still perfectly acceptable from a grammatical standpoint. So why not use it? Language should still be a reflection of the writer's personality, and if said writer can use it as such whilst still maintaining the proper grammatical standards of the situation? So much the better. And this shouldn't hold one back from applying the same approach in less formal situations. I like old-timey words and phrasing. Maybe this comes from my dear foreigner mother, who still peppers her language with phrases like "donkey's years" (meaning a long time ago). I default to either overblown academic sentence structure (see the first sentence of paragraph three) or 19th century-esque Southern colloquial slang. This is one of the reasons why, if we would've had a son instead of a daughter, I would've made a half-hearted push for Delmar as a name. My lovely spouse, for the record, is relieved that this never became a serious argument. Huckleberries hold a place in archaic American English slang. The tiny size of the berries led to their use as a way of referring to something small, often affectionately as in the lyrics of Moon River. The phrase "a huckleberry over my persimmon" was used to mean "a bit beyond my abilities". "I'm your huckleberry" is a way of saying that one is just the right person for a given job.The range of slang meanings of huckleberry in the 19th century was fairly large, also referring to significant persons or nice persons. First, this alone justifies Wikipedia's existence. More importantly, we need to start a movement to return huckleberry to the contemporary slang lexicon. We have to turn this viral! I want to see huckleberry memes! All hail the great huckleberry! I realize that the task of getting the common folk to actually use these slang terms might be a huckleberry over my persimmon. I will still try, however. The fruit deserves all of our best interests. The article "Everything Doesn't Happen for a Reason" tells an awful lot of truth. Is it good to try and grow from tragedy and heartache? Of course it is, but to then say tragedy and heartache are essential and good? That's a sentiment only a sadist would support. I played an impromptu set at an open mic night tonight. I always come into these with zero expectations, but tonight went pretty well...and this is most visible in two items. First, I made a sale! New fan! She got a CD...and a sticker...and a guitar pick! She paid partly in quarters...which means I can do more laundry! Second, and most awesomely, I made another fan..and it's Mechanical Cat! Bowling Greeners will understand how awesome this is. Not only did he complement my stuff, he sat down, and we talked for a while. He even told me the plot of the hopefully forthcoming animated series. So I call tonight a success. 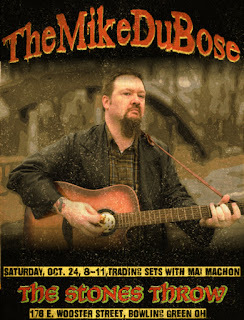 I have a show next Saturday, October 24. I have high hopes that I will be joined by my colleague/tromboner Nick Zoidberg. This time, I will be splitting the bill with Max Machon (a nice guy and a good songwriter). The show's from 8-11, and as soon as I find out when my slot is, I will let you know. 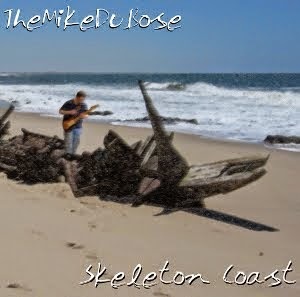 I will have copies of my debut album Skeleton Coast for sale, alongside my handmade tee shirts. I've got new originals and new covers to debut, so it should be a really fun night. I would love to see you there. I am currently recording an album. No, not the album I told you about a while ago (which is still being delayed for...um, reasons). I'm talking about the previously announced second album project. I have drums recorded for all the songs. I have acoustics and vocals recorded for three of the songs, and I have distributed these to my awesome bassist Steven Guerrero, with whom I play with in Midwest Tourist. Steven also does solo music under the name Flat Earth Agenda, and you should buy his album. I'm thrilled that Steven agreed to play on the new album. I still have to do more acoustics and vocals, so I can get the rest of the songs to Steven...but this damn death cold/flu/plague I have is slowing up the process a bit. As soon as I get the bass-added tracks back, it's time to finish the arrangements and record the rest of the instruments...and I'm thrilled that Nick Zoidberg has agreed to help me with all this. I might throw some demos up pretty soon, so you can hear what I've been up to. The one thing I'm lacking? A good name for the album. Suggestions are welcome. Hey, give me a great name, and I'll even give you album credit! 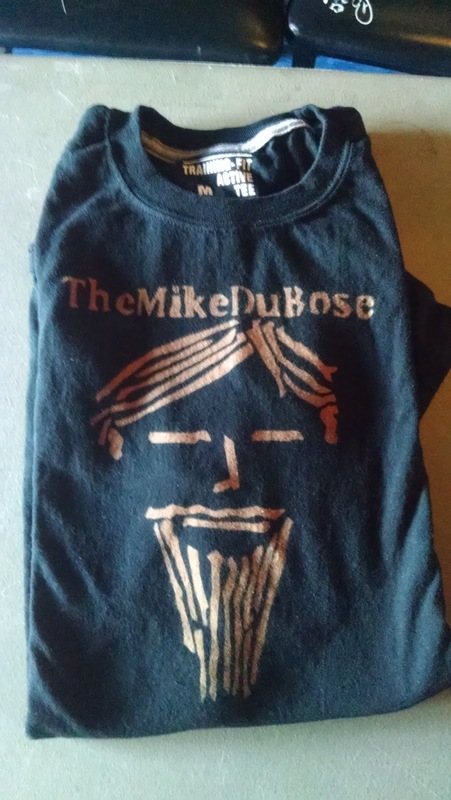 Oh, did you hear me say I have new tee shirts for sale? I did these a little while ago, and they're pretty cool. It's all handcrafted, so each one's a little bit different. Hey, it's the arty touch! Supplies are limited, so shop now! Plus you know you've always wanted to have my face on your chest. I also just got a November show at Iggy's in Toledo. I will be playing on November 27th, opening up for My Hated Friend. They're pretty funky and trippy...good dancing music! I'm not sure what time I go on, or who else is on the bill, because I just found out about the show this week. As always, more details when I get them. Other than that, I'm still working on more shows at new venues. Losing the Adrian shows was a blow, but I"m pushing to recover. Hey, any of you own a music venue? Need an old, fat guitarist to entertain your friends? Still true all these years later...maybe even more so. My daughter, on the way home from school, was telling me about a game they played. It was apparently "so fun, it will make your teeth fall out." Ponder that one for a while. She also told me a joke. "What keeps your teeth together? Toothpaste." My daughter seems to have inherited my musical abilities. Not only can she make a whole heck of a lot of noise (something at which I too excel), she also writes songs. Like my songs, hers have something a little...unusual about them. This morning, she sung me her latest composition. The lyrics: "One, two, three. I love me. I love rocketship and red raspberries." Last night, after a productive yet mostly uneventful day, I got some bad news about a friend of mine who's in trouble. It tears me up that I can't immediately fly across the country to be with him. If there's a downside to being a failure in one's chosen field, this is certainly part of it. As-is, though, there's little I can do from here on the sidelines but send good vibes...for whatever good that does. It's frustrating that I'm rendered merely an observer where I want to be a friend, but this is part of the "if you thought about it, you'd only grow madder/crazy/whatever" school of thought. So I tried to put my personal anger and disappointment at the world out of the way and focus on doing what I can from the sidelines. Of course, this never works. 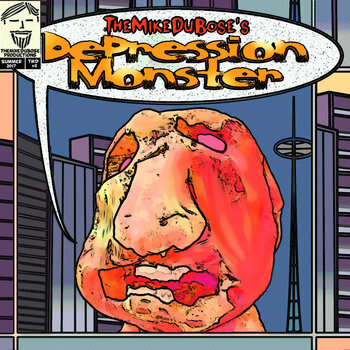 To the credit of my therapist and my psychiatrist, I did not fall into a depression fit, instead merely getting sad. I must've been sadder than I realized, though, because in spite of my sleeping pills, I did not get to sleep until around 4:20am. Let me tell you: the 8am alarm felt really scary. This is sure gonna be one interesting day.